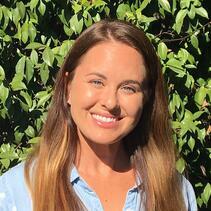 Erin Drum serves San Diego Zoo Global as a Research Associate in Recovery Ecology. She currently works at the Pacific Pocket Mouse Conservation Breeding Facility. Erin is responsible for the daily care, husbandry, and propagation of our pocket mouse breeding population. Her responsibilities include not only maintaining the health and well-being of the mice, but also continuing the proliferation of the population and preparing the mice for release using predator aversion training. Erin earned her bachelor’s degree in Biology from the University of West Georgia. After moving to California, Erin found she was spending most of her free time at the San Diego Zoo, so she became a volunteer Information Ambassador. Erin began working with the pocket mouse program in 2015 as a volunteer before quickly realizing she wanted to work in conservation full time. Erin enjoys hiking and going to the beach with her labrador retriever on her days off, but if she isn’t there, you will find her at the zoo.